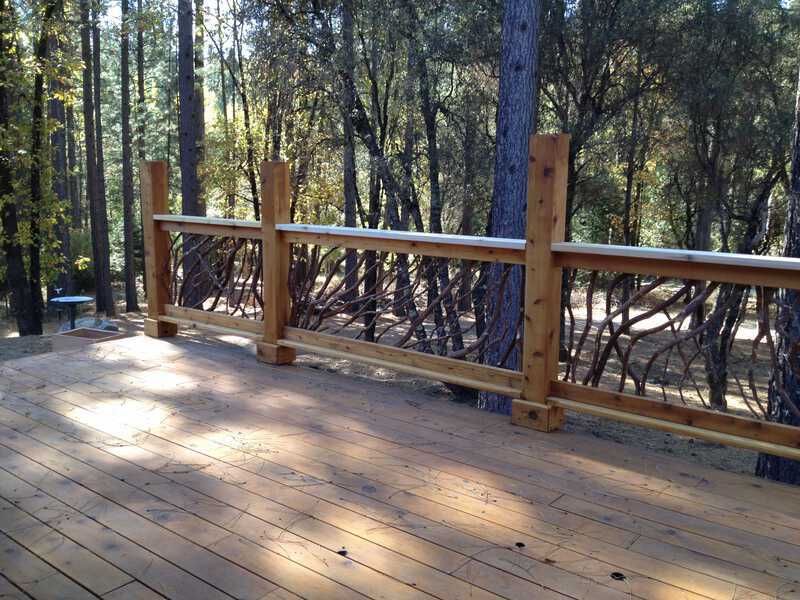 We couldn’t imagine a better deck railing for this cozy home hidden away in a California forest. 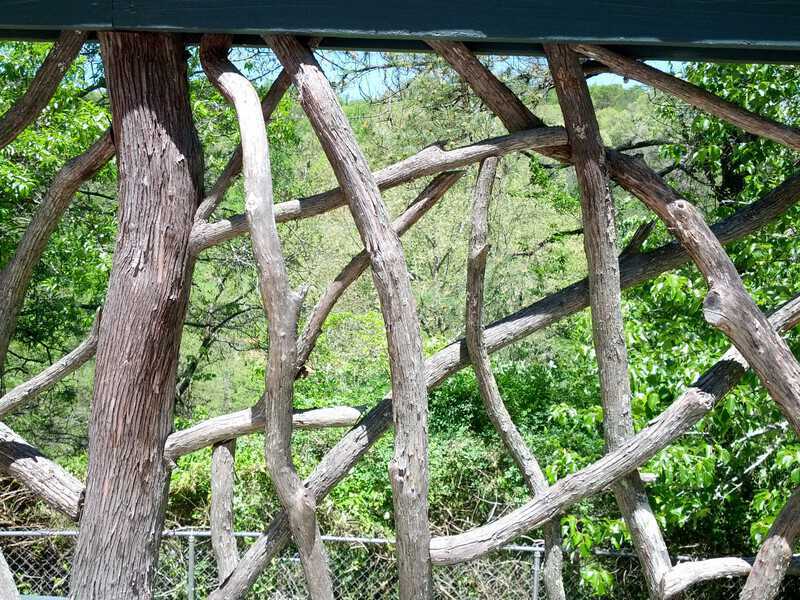 While railings are available in many materials from wood to metal and glass, this one with bark covered branches clearly is the perfect choice. 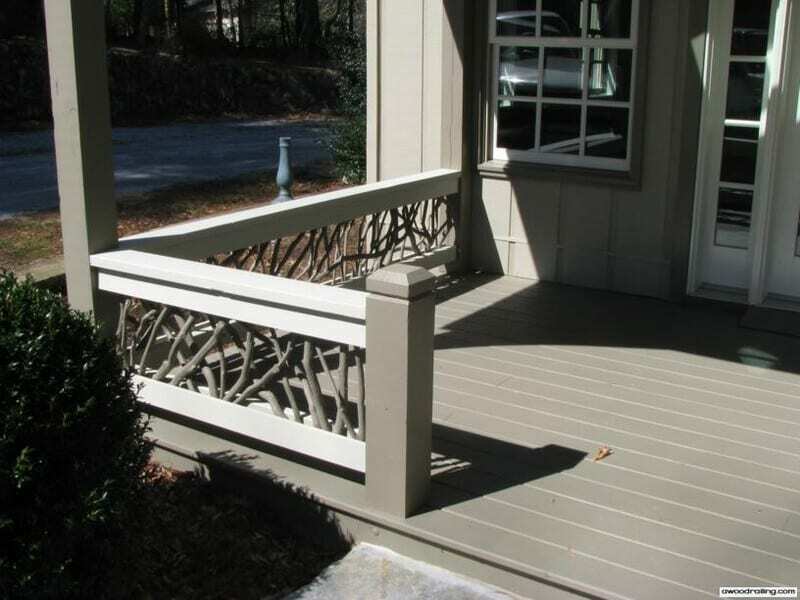 The following pictures will show how the right railing design is key to preserving the character of your home and its surroundings. 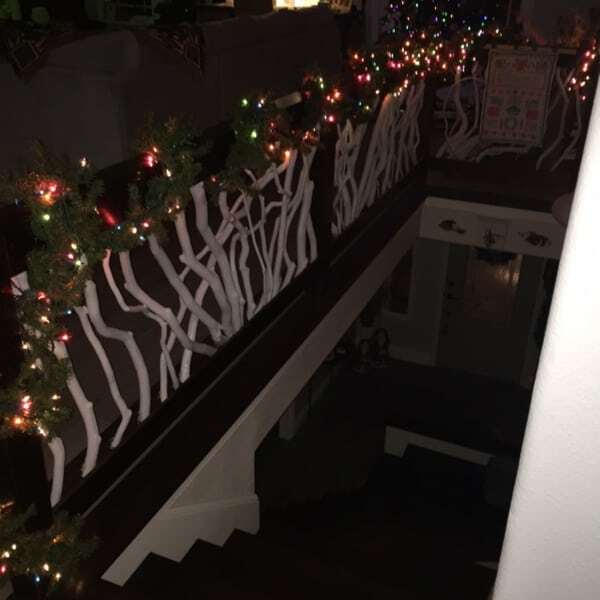 Notice how the branching balusters in the California deck railing echo the shapes of the pine trees beyond. These complementing forms ease the transition from the outdoor living space to the landscape seamlessly and… beautifully! 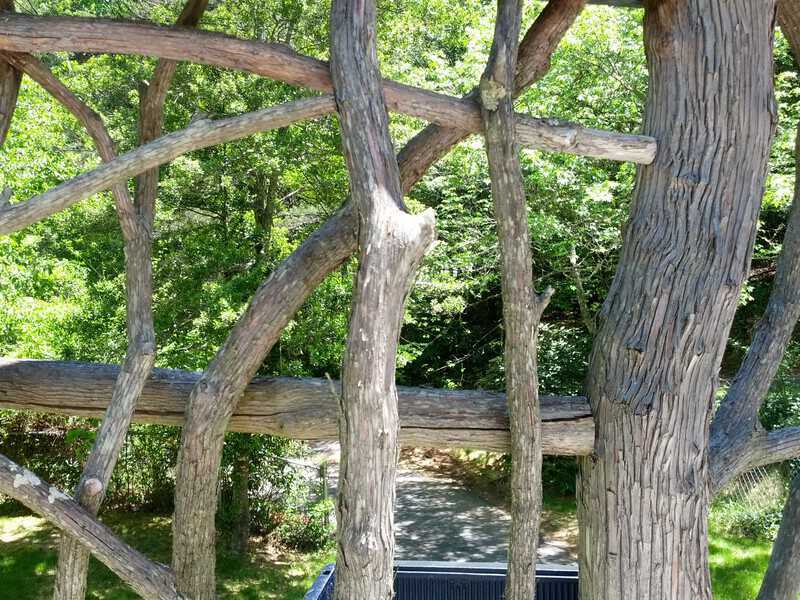 In fact, the Mountain Laurel railing becomes part of the landscape. 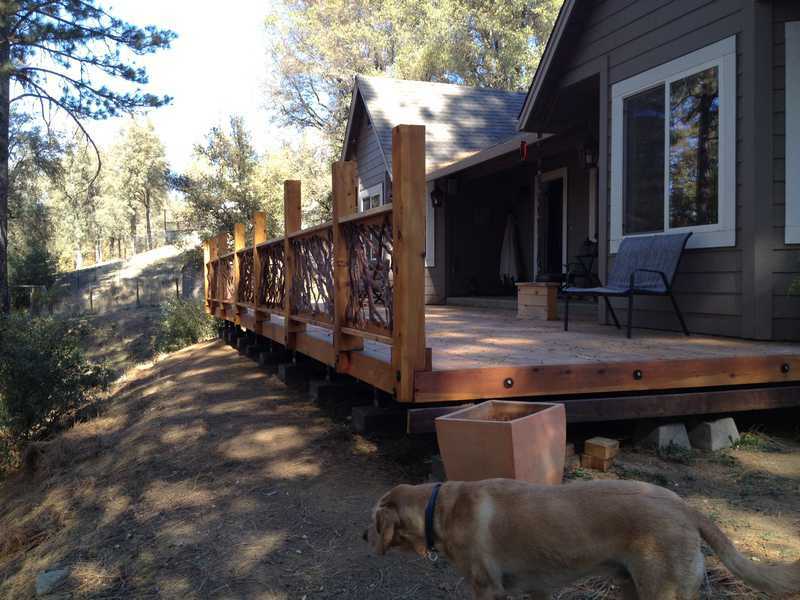 The homeowners further customize their deck by selecting chunky, yellow pine posts to support each railing section. 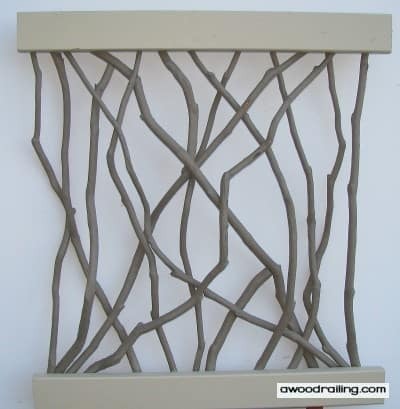 The wood grain features natural whorls or knots that enhance the overall rustic look of the outdoor space. As a design note, we like the way meandering branch balusters contrast with the linear floor boards. 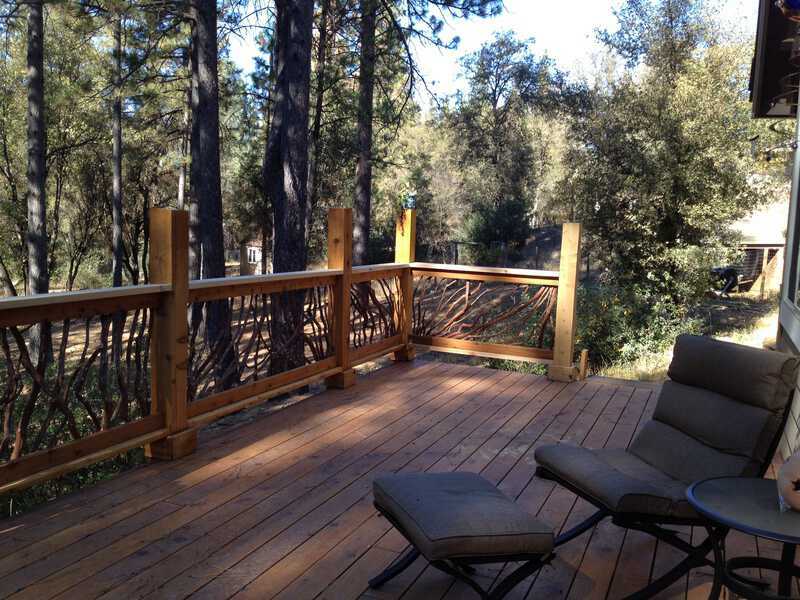 The variation in form adds a visual twist to the California deck railing. 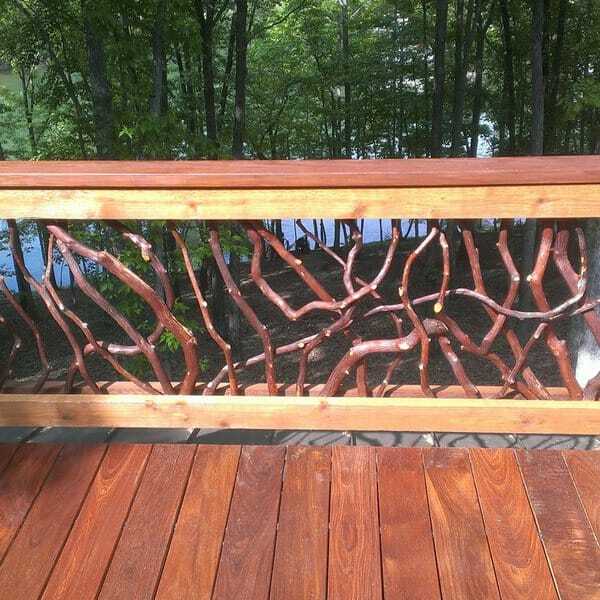 Beyond beauty, the Mountain Laurel handrail is necessary as a safety feature. The platform deck rests on the edge of a steep slope. 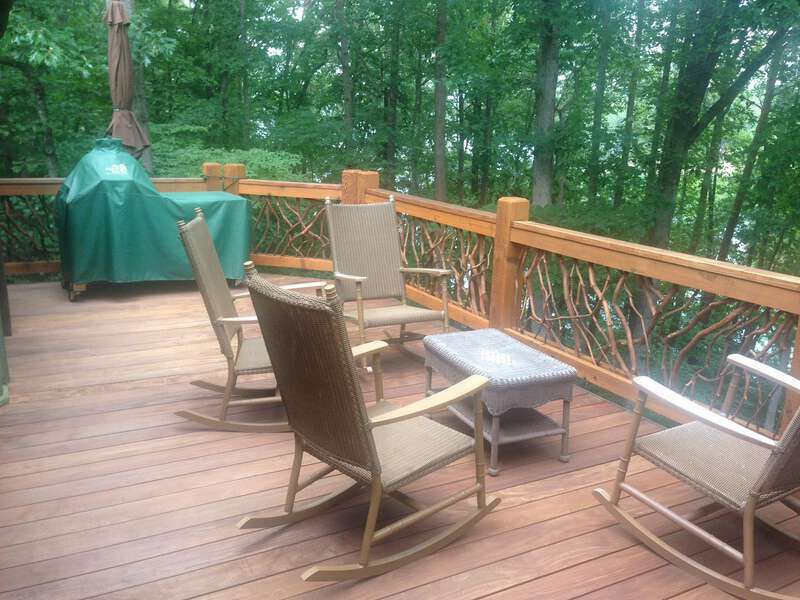 By installing the decking system, the homeowners are able to turn this area into use-able outdoor living space. And of course, now they can relax while taking advantage of the incredible view! From concept to installation, take the time to craft the right railing design to capitalize on your outdoor surroundings. 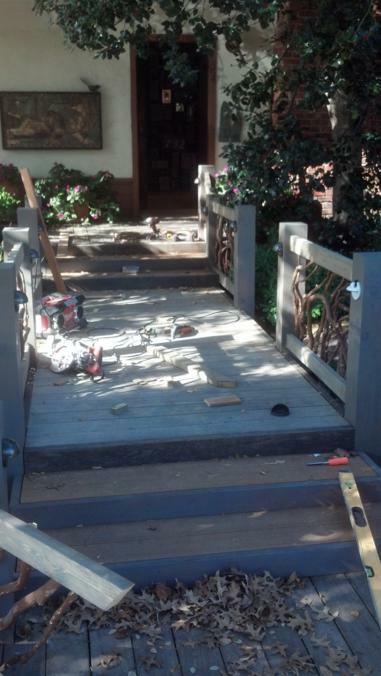 As you can see, the homeowners of this California deck railing did just that. The result allows for more outdoor living space, greater visual appeal and beautiful views. 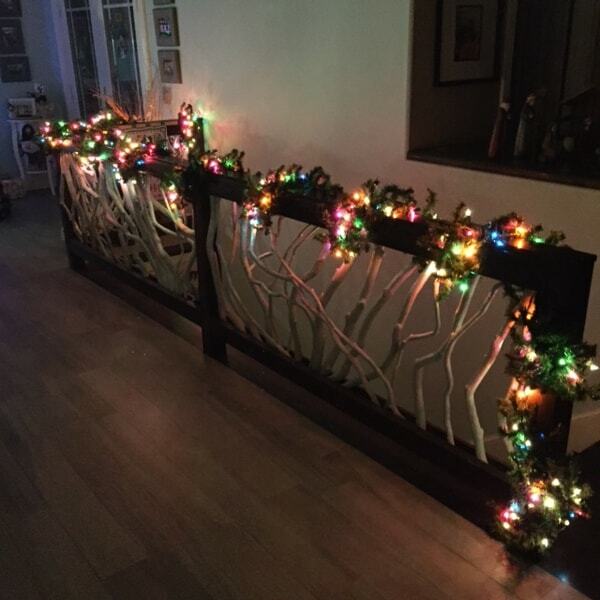 To make your dream railing a reality contact Mountain Laurel Railing today! 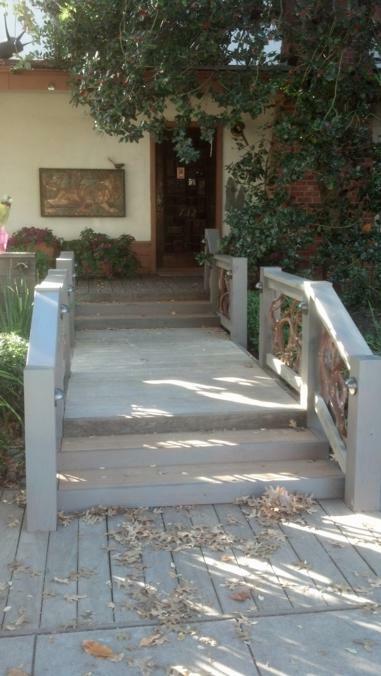 This handrail installed on a breezeway for a home in Palo Alto, California really shows off all there is to love about these intricate wood railings. 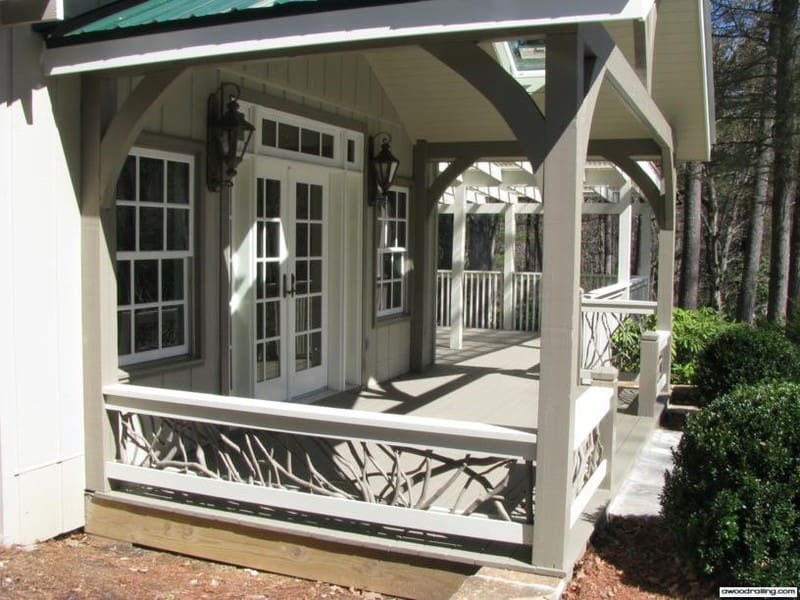 At Mountain Laurel Handrails, we help you to choose the best deck railings, furniture, and other exterior and interior railings to give your home an elegant rustic feel, a real mountain home. To keep the theme going throughout your beautiful house is simple and requires only small adjustments to your existing house. I’ll attach the pictures I have! The project was finished some time ago and turned out beautiful. Send me a link so I can see what you put up. Mountain Laurel Handrails is dedicated to helping California residents enhance the style of their homes with high quality hardwood handrails. No state has the diverse range of landscapes that California can boast and whether you live in Northern California, the Bay area, Central California or Southern California, you deserve to have a beautiful place where you can step outside and view the great outdoors. The handrails that you use to complete your deck will help to determine its level of safety while enhancing its appearance, so you don’t want to settle for anything less than the best. 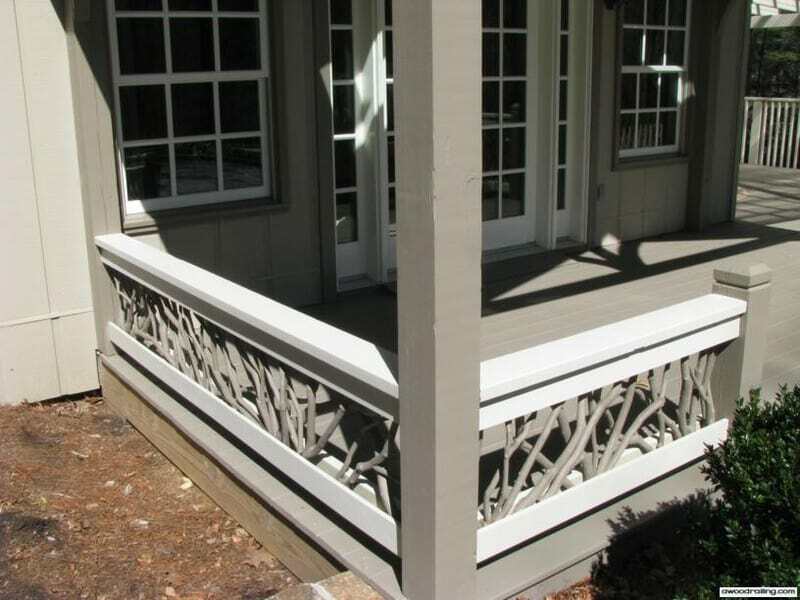 Mountain Laurel Handrails stands out due to the painstaking attention to detail with which every one of our hardwood deck rails is manufactured. When you choose our deck rails for your California home, you can be certain that you’re getting the absolute best solution to enhance your exterior decor and ensure that you can safely enjoy the beauty of your view. 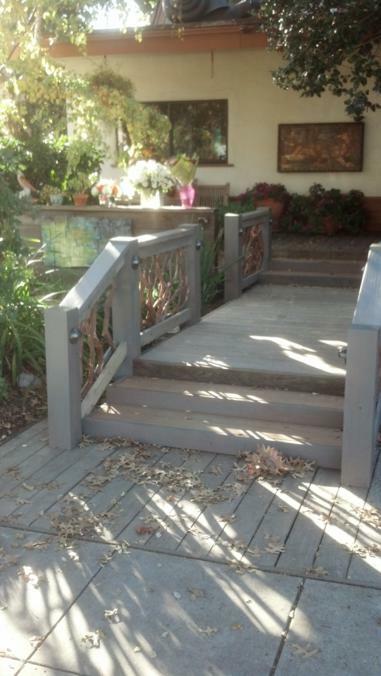 From Palo Alto to Pasadena to every other corner of the state, California countless homeowners have put their trust in Mountain Laurel Handrails. 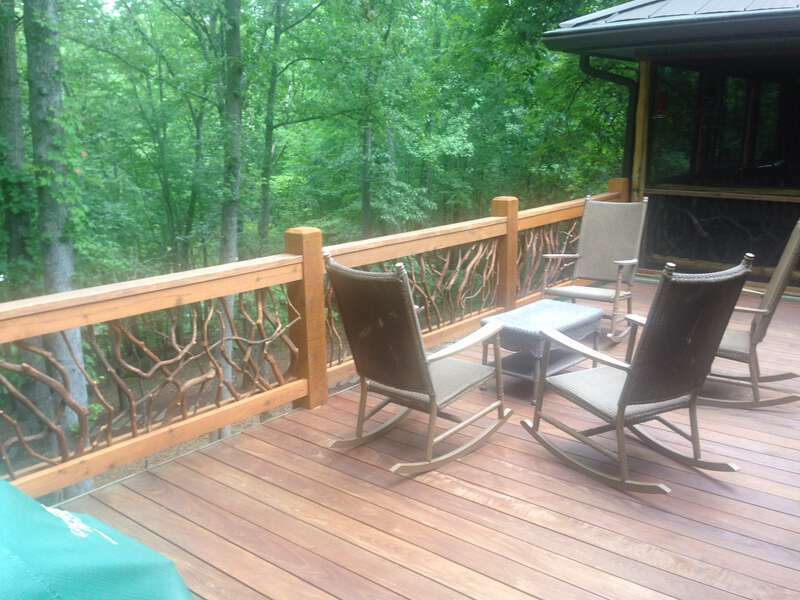 Not only do we offer the very best deck railings that money can buy, but we also offer a wide array of other hardwood railing products to help complete the look of your home. We have created a number of interior railings to bring the beauty of handcrafted hardwood into indoor spaces in living rooms, bedrooms, entryways and other locations in homes. Whether your decor is rustic, modern, inspired by nature or country chic, we can create an interior railing design that will add to the ambiance of your space perfectly. 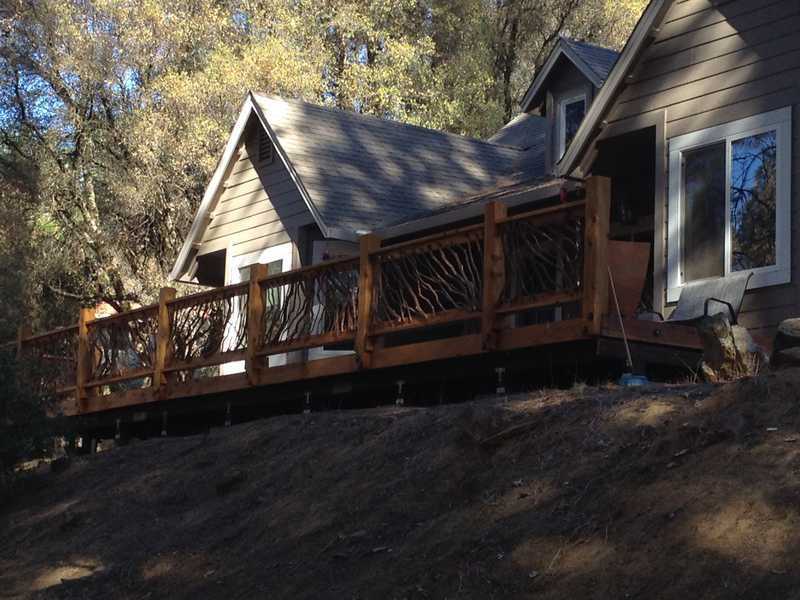 At Mountain Laurel Handrails, we have the expertise and skills needed to create quality hardwood railing for any use inside or outside California homes. 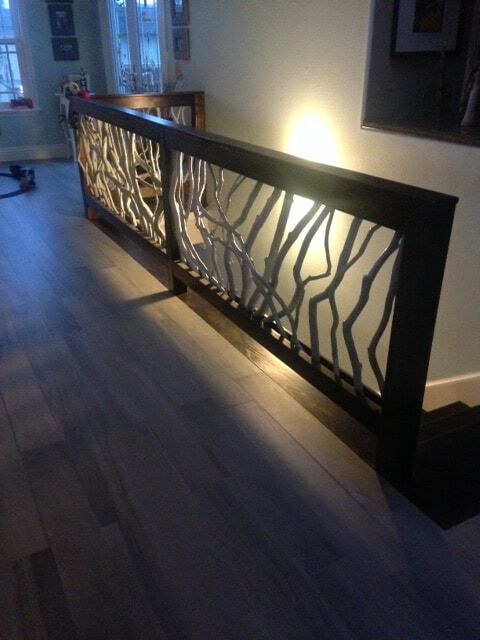 We offer curved railings and log railings as well as custom decorative railings that are designed to order. 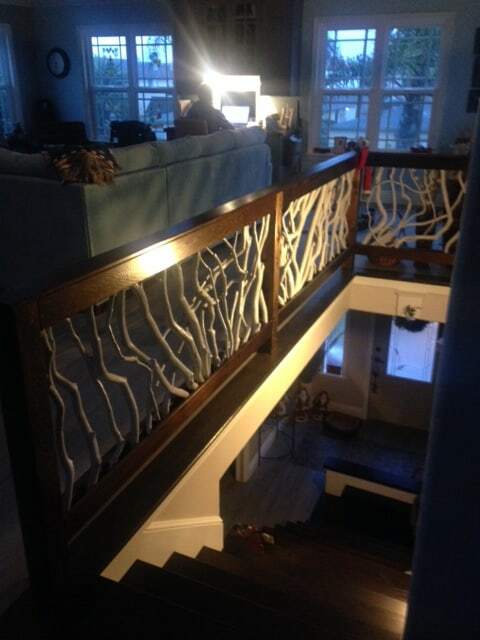 If you have a project in mind for your California home that calls for a special decorative flourish, let us transform your idea into a high quality wood railing that will look just as you pictured and stand the test of time to bring beauty to your home for years to come. The difference in the quality of Mountain Laurel Handrails comes from our unique approach to manufacturing. 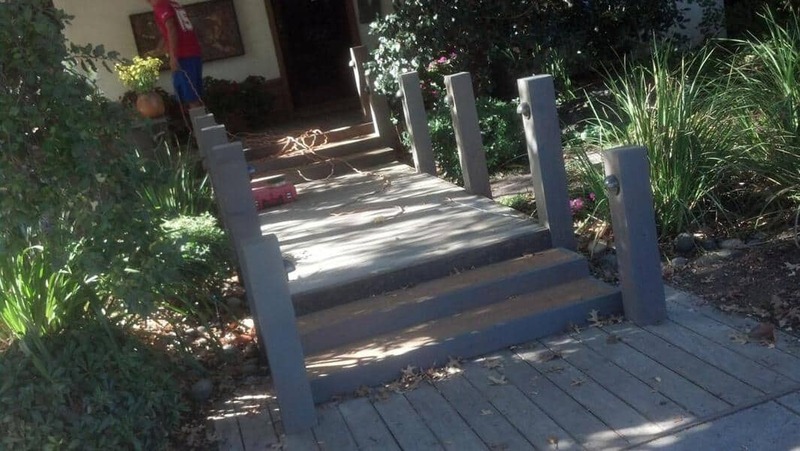 We don’t mass produce our railings for California homes along an assembly line. Instead, we individually craft each railing by hand the traditional way. Our team of independent woodworkers takes pride in every wood railing that we produce, working hard to ensure that each piece is flawless. By using only the finest of hardwoods, we are able to offer an unparalleled level of quality to customers throughout California. 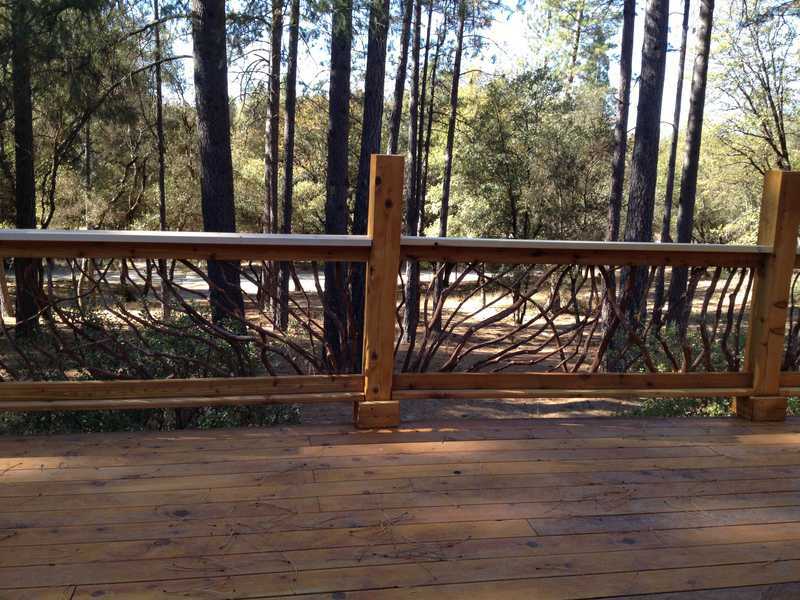 Whether you’re looking for the ideal railing to complete the deck in your California home, want something beautiful to line your walkway or would like to finish off your interior with a gorgeous handcrafted railing, Mountain Laurel Handrails is ready to assist you. Contact us today to learn more or fill out the form to the right to request a product guide. For more ideas or if you have any questions, please let us know. Installing Mountain Laurel Handrails is easy! Basic carpentry tools and skills are required, however. Here you can see that the carpenters have out the most important tool: the jobsite work radio. The radio is the first thing to come out of the truck with all the power cords and electrical boxes, and the last thing to get put away in the evening. But seriously, the carpenters are using a level to make sure that the railings are level as they are installed between the posts. A circular saw is needed for cutting the ends of the sections as well as additional lumber and boards that are required to complete the project. 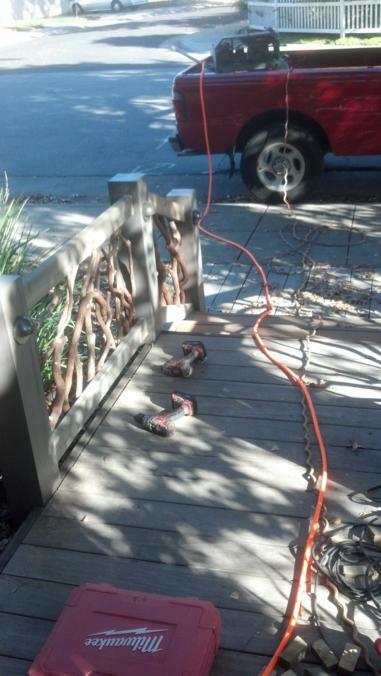 An air compressor and nail gun make installing certain boards quick and efficient. Mountain Laurel Handrail sections need to be screwed into the posts to get a strong connection and attachment point.